If you think you need a bold sofa in your living room to make a grand statement about your interior style, think again. Despite the pale, often stark white colour of a white leather sofa, you’d be surprised at just how malleable they are to your interior design input. Think of it like a blank canvas, and your flare for accessorising is your paintbrush. There are some sofas that can get away with no acces­sorising, and this Vogue Faux Leather Sofa Bed is one of them. Sure, you’ll need to add a duvet or sleeping bag to the mix when it’s in use as a bed, but when its not you can let its beautiful design speak for itself. This white faux leather sofa bed will look amazing in any contemporary living space, it’s a perfect example of when you don’t need to accessorise. Plenty of sofas today make use of more than one colour; whether it’s contrasting colours in the upholstery, different coloured piping or wooden bun feet poking out from under a white leather sofa. 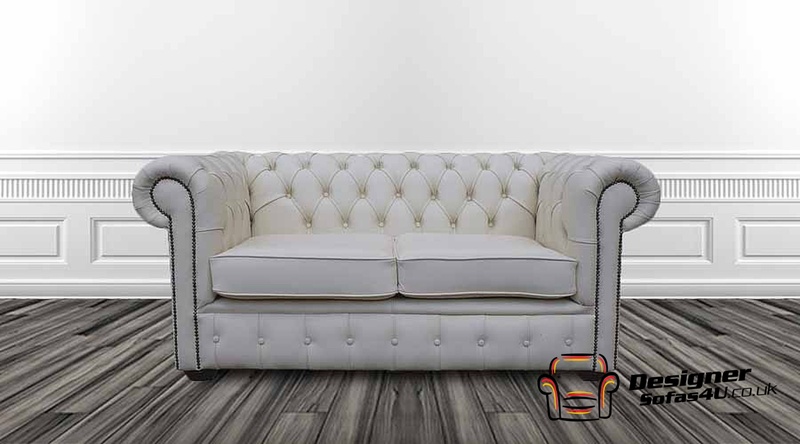 This Chesterfield 2 seater white leather sofa has a deep buttoned finish, with deep arms and seats and black studs lining the classic Chesterfield rolled arms – it lends itself perfectly to a pair of dark, possibly black cushions. Thick black cushions will accentuate the depth of the sofa, as well as highlight the shadows in the deep buttons and the black studs lining the arms. They’ll also provide some support for anyone with legs too small to comfortably reach the back of the sofa. You can use accessories to tie the use of your white sofa in with the colour theme of your living space. This Diego corner sofa has been finished with a chaise lounge seat – ideal for someone looking to kick back and relax after a long day at the office. And what’s better to relax with than a nice thick woven blanket that’s just in reach? This sofa is almost custom made to have a throw draped over its high, comfortable cushions. And because the sofa is white, it can blend perfectly in with any theme – all you need to do is choose a throw that complements the main colour you’ve been working with in your living space. We’re not just manuf­ac­turers; we’ve worked with sofas for so long that we know everything there is to know about them. If you have any questions at all, whether about accessorising your sofa or otherwise, get in touch with us today. You can call 01254 268590, send us an email or fill in our contact form and we’ll be more than happy to help.